Clemson Girl: Marley Lilly Monogrammed Clemson Scarf Giveaway! 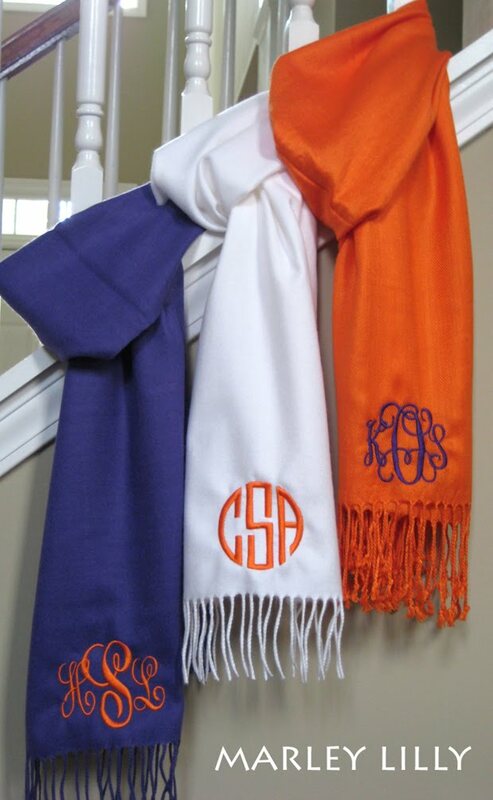 Marley Lilly Monogrammed Clemson Scarf Giveaway! One of our fave sponsors Marley Lilly is celebrating the launch of their very new website – so now you can shop and purchase all of their amazing personalized products conveniently online! Marley Lilly wants all of you to celebrate the big launch of their new site too. That’s why they are offering all Clemson Girl readers 10% OFF sale on EVERYTHING! Tuesday and Wednesday only! Just use coupon code CLEMSONGIRL at checkout and the entire order will be reduced by 10% off. Don’t miss out on this opportunity – this is the only sale they will have for the remainder of 2010. You can also visit Marley Lilly in person this Sunday, Oct. 31st – Marley Lilly will be hosting a Holiday Gift Show at the Barrington Park Clubhouse in Greer from 12pm-5pm. You will get the chance to see the entire new inventory before Christmas and place an order to guarantee an early delivery date! And last but definitely not least… Marley Lilly is giving two lucky readers a monogrammed scarf – one in orange and the other in purple! They feel like cashmere. Perfect for a Clemson game! To enter the giveaway, simply comment on this post with your first name, last initial, and where you’re from. That’s it! Deadline for entries is tonight at 8:30 pm EST – we will randomly draw two winners and announce it on the blog shortly after. Good luck ladies!! This is a fantastic giveaway! Contest is complete. Winners have been announced. Thanks for entering! Carolyn Q. from Rock Hill, SC. LINDSEY M. I ABSOLUTELY LOVE THEM. THERE SUCH A CUTE IDEA. Brittany C. from Columbia. SO cute!! Tania F. Saint Stephen, SC! I am 44 years old and just now a couple of months ago decided to go back to school. Yeah, I know..scarry! lol I am attending nail tech school and should be finished around Christmas. 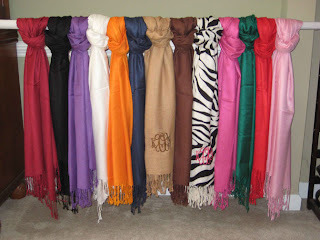 I am trying to lose some weight, hopefull little by little improve my fashion...Lord, who am I kidding, I need a whole new makeover...lol One of these beautiful scarves would be a GREAT start for me! I love the scarfs and I absolutely love the Brand Name considering my daughter's name is Marlie! So cool to hear of a Marley line of items! Love these scarfs! Perfect for game day! This is the cutest idea I've seen! 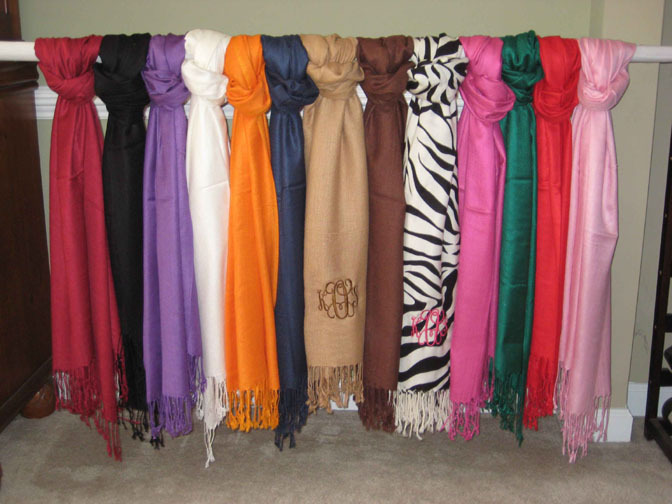 I live in NYC and see these kinds of scarves all the time, but never thought of monogramming them. I'd love to have one! This is fabulous. Rachel W. Fayetteville, NC. I love the scarves! They are totally HOT! - Aimee W. Dye from Greenville SC!!!!!! We need some orange/purple in GA!!! 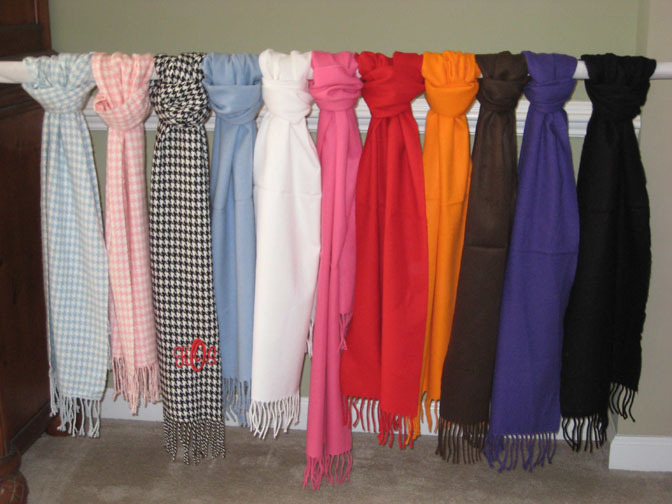 I would love to sport one of these beautiful scarfs at the Boston and USC game! What a great idea!!!! I absolutely love the scarves!! Taylor W from Indian Land, SC! I enjoyed very much; lovely and enjoyable. Sarah R. Anderson, SC and tagged you both on my facebook status! Love, love, love these scarves! Love me some CLEMSON TIGERS! LOVE all the cute stuff on MarleyLilly.com ! Love the new site, Kel! Stephanie N. Currently in Chicago, but moving to SC this weekend and plan to hit lots more Clemson games once I'm closer. I've made it to one game a year since graduation, and can't wait to make it to more! I love all the super cute fashion ideas (and being a Clemson girl)! Love the scarf!! Every Clemson girl needs one of those. Perfect for a Christmas gift..
Elizabeth H from Florence, SC loves the Marley Lilly Monogrammed Scarf.